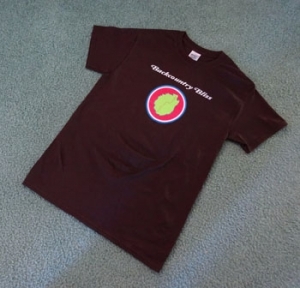 Welcome to our storefront where you can purchase Trans Adirondack Route merchandise. If you're an individual customer, use the fast and secure Paypal option for each item. Orders ship once a week from our global headquarters in Rensselaer, New York, and we do not ship outside the Lower Forty-Eight. If you're a retailer, you can establish a wholesale purchasing account for books. We sell directly to you, not using bloated middlemen such as Baker and Taylor. This ensures you get our titles on the cheap and quickly. If you want to establish a wholesale purchasing account, let us know via our contact page. Published by Beechwood Books in 2019. By Erik Schlimmer, foreword by John McEneny. 510 pages, 135 images. Our only urban title. Ground-breaking research and writing historically decodes the City of Albany's 785 street names. Published by Beechwood Books in 2016. By Erik Schlimmer, foreword by Jack Drury. 232 pages, 45 images. Schlimmer tells the fascinating and historic stories behind 224 named features in New York's largest wilderness area. Published by Beechwood Books in 2015. By Erik Schlimmer. 270 pages, 10 images. The Northeast's most notorious explorer conveys tales from the backcountry. Camps with cops, chases bears, gets lost, and eats apple pie naked in the woods. Voted Best Memoir by the Adirondack Center for Writing. Published by Beechwood Books in 2014. By Erik Schlimmer, foreword by Michael Kudish. 238 pages, 30 images. As the the first highly-readable Adirondack place name book ever written, this tome offers a complete Adirondack historical picture. Published by Beechwood Books in 2013. By Erik Schlimmer, foreword by Laura Waterman. 290 pages, 9 images. The only guide to the East's wildest pathway. Besides detailed route descriptions, this guide includes all information needed for a successful thru-hike. Published by Beechwood Books in 2013. Designed by Friends of the Trans Adirondack Route. 26 pages, overview map, list of shelters. 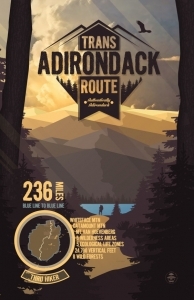 The only map set detailing the entire Trans Adirondack Route. 4.6 ounces, 1:40,000 scale, 100-foot contour intervals. Designed for use with Blue Line to Blue Line. Purchase the maps and the guidebook together and save money. Designed by Friends of the Trans Adirondack Route and Mitchell Biernacki. We know you have at least four walls for this artwork. Printed in vibrant, crisp color on high-quality paper. 11.25" by 17.25". Suitable for framing. A stylish long-lasting fashion statement never looked so good. Available in small, medium, and large. Blissfully good and 100% fat free. These patches are turning heads. Designed for rugged use, our 3.5-inch logo patches have a tight, crisp pattern. Show your true Adirondack colors. Our three-inch logo stickers are printed in full, vibrant colors and are designed for indoor and outdoor use. Stick them on water bottles, vehicles, laptops, travel mugs, and anything else that needs flair. Our books are also for sale on our publishing site, Beechwood Books, which can be visited by clicking here.